Want To Sell Your 1955-1962 Morris Garages MG-A? Ask Chicago Car Club! Are you wondering "where to sell my MG-A ?" The Chicago Car Club is interested in classic cars of all makes and models, especially a MG-A. We make the process of selling your MG-A quick and painless. In just a matter of hours we will have your classic valued and, if you do so choose, turned into money in your pocket. All it takes is a phone call or electronic inquiry to get the ball rolling. After only 18 months in its, production, the MG TF 1500 was replaced by a much more modern sports car called the MG-A. This new model was officially announced at the Frankfurt Motor show on 26th September 1955. It brought a total styling break from its predecessor. This new model had a streamlined body and with the side members further apart. The previous TD model had a high seating position making it very inconveniencing for the driver. To improve on this, the MGA’s floor was attached to the bottom of the frame section. This model was fitted with a BMC corporate B-series engine that allowed a lower bonnet line. The convertible MG-A did not have exterior door handles unlike the coupe. The engine had a 4-speed gearbox and its suspension was independent with wishbones and coil springs at the front and a solid axle with semi-elliptic springs at the rear end. The steering was rack and pinion. The wheels came in either steel-disc or wire-spoked. Over the years, the model was improved and by May 1959, the engine was upgraded to 1588cc producing 59kW; 81PS. Also, front disc brakes were incorporated with the drums remaining oin the rear end. 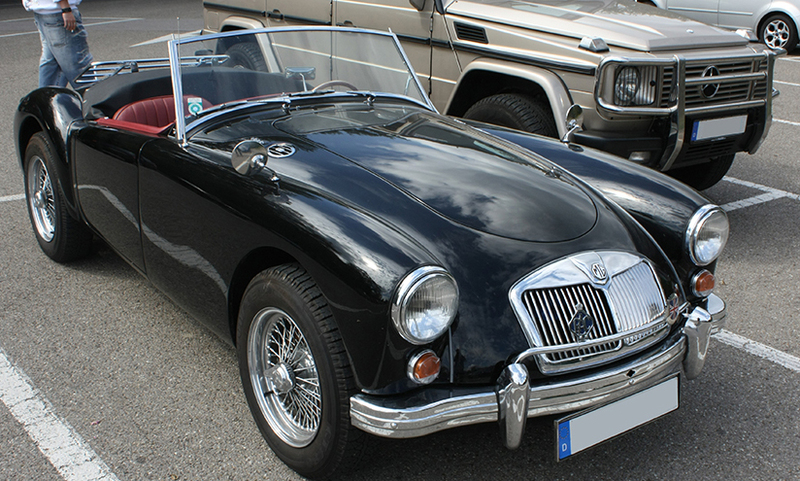 The Mark 11 and Mark 11 De-Luxe MGA were introduced in the market with an engine capacity of 1622cc. The horsepower was also increased to 90bhp and a higher ratio 4:1 rear axle incorporated. This made it possible for a more relaxed and high-speed driving. The MGA has been used to race extensively in the U.S. since its introduction in 1955 and has had considerable success in the same. It won quite a number of competitions both regional and national in the sports car club of America. It has also made quite a number of film and television appearances and is quite an exotic classic to date.